DENVER -- Colorado's attempt to create a bank to service its marijuana industry has suffered another setback by the federal government and could be facing an impossible dilemma. The Federal Reserve — the guardian of the U.S. banking system — said in a court filing Wednesday that it doesn't intend to accept a penny connected to the sale of pot because the drug remains illegal under federal law. "We're frustrated," said Andrew Freedman, director of marijuana coordination for Colorado Gov. John Hickenlooper. "We tried to do the most with the building blocks of instructions they sent us, set up the most rigorous solution. And we still are left with confusion." The filing came in a legal battle between the Federal Reserve and the would-be Fourth Corner Credit Union, which was set up last year to serve Colorado's $700 million-a-year marijuana industry. The credit union can't open without clearance from the Federal Reserve, which said in its filing that "transporting or transmitting funds known to have derived from the distribution of marijuana is illegal." "It's a phenomenal question about executive action," said Peter Conti-Brown, a lawyer and banking historian at the University of Pennsylvania who is following the case. On one hand, the Federal Reserve is standing in the way of the stated goal of the Treasury Department to "enhance the availability of financial services for, and the financial transparency of, marijuana-related businesses." But by allowing pot industry money to mingle with funds from other national commerce, the Federal Reserve would be removing one of the final barriers to marijuana acceptance. 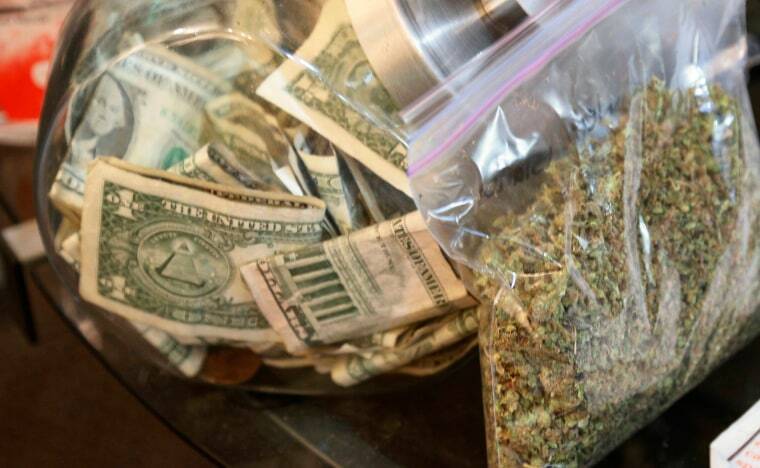 The Federal Reserve said in the latest filing that bankers won't be led away in handcuffs for taking marijuana money, but they don't have the right to put that money in the Federal Reserve system. By pushing for approval from the Fed, it was "as if Colorado enacted a scheme to allow trade in endangered species or trade with North Korea," the filing says. The mixed signals have left Colorado's marijuana industry in a bind. Many shops still operate in cash, unable to accept credit cards or make other electronic transactions. "We're still a Schedule I narcotic at the federal level," said Tyler Henson of the Colorado Cannabis Chamber of Commerce, which represents pot growers and retailers. "We can provide every Band-Aid imaginable at the state level, but until the federal government acts on this, we're stuck." Deirdra A. O'Gorman, CEO of the still-unopened credit union, said she's more optimistic. A Federal Reserve account does not mean it is legitimizing an illegal industry, she said. "We'll be able to figure this out sooner rather than later," O'Gorman said. But Conti-Brown, the banking expert, is doubtful. "I don't think the lawsuit is going to go anywhere," he said. The presiding judge in the case, U.S. District Judge R. Brooke Jackson in Denver, has given no indication when he'll decide whether to hear the complaint filed by Fourth Corner.